Thames Discovery Programme - Firewatchers Needed! What have no 9 Carmelite Street and no 2a Eastcheap got in common? Both these elegant 19th century buildings are close to the Thames and served as the City’s river fire stations during the Blitz, numbered R3Z and R3Y respectively. 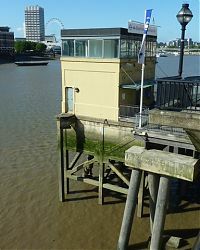 There were some eighteen such river stations along the length of the Thames during WWII, used to accommodate the crews on 24-hour standby to man the firefloats such as the Massey Shaw. The firefighters had to be ready to confront conflagrations in waterfront warehouses, riverside industries, power stations or gasworks, as well as vessels ablaze on the river. The two City buildings still survive today (albeit as offices and an EAT café) but what of the pontoons and other facilities used by the crews and their fire floats? The contemporary London Fire Brigade pumphouse at Blackfriars (R3Z) is still there, and can be seen on the west side of Blackfriars Bridge. It was designed by the LCCs Chief Engineers Department and was completed in early 1940. This historic survival (which is now incorporated into the new Millennium Pier pontoon) is being considered for listing by English Heritage. They have asked the Thames Discovery Programme if we have seen any other surviving evidence for the fire service, on the foreshore or the riverwall, on any of our perambulations? 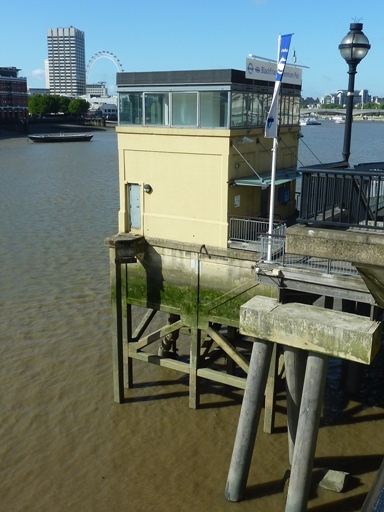 The base of the pontoon used by the R3Y Station may have been located underneath the walkway below Billingsgate/ Fresh Wharf, for example. The stations in our area are listed below: are they near you, and if so, is there any surviving evidence of their use during the dark days of the Blitz? Do the station code letters survive anywhere? Brigade, the ‘Thames Formation’ had but 68 officers and men at the three main river stations: Lambeth (Massey Shaw), Blackfriars (Gamma II) and Cherry Garden (Beta III). been increased to 386, and they now had a fleet of 30 boats (including the “James Braidwood”) and 40 barges. Each pontoon would therefore be large enough to have c 2 fire-boats and 2-3 barges moored there. If there is a pontoon there today, has it been renewed since the 1940s? The ‘new’ Fire Stations inland were usually requisitioned schools or large offices etc, with enough room to provide dormitory and catering facilities for crews on standby round the clock. Is there a surviving, suitable -pre 1940s building nearby? It would have once had large clear (hand-painted) signage marked ‘R2Z’ or whatever: probably somewhat faded by now! I have been told that Google Earth have recently made available a 1945 aerial photographic series for London, and there are also RAF London APs for 1944 in the public domain: if any of you can access these for your particular areas, you should be able to locate the pontoons more easily? Please contact Gustav Milne if you have any information, or would like to find out more.